Romy: Welcome to another episode of Bonfires of Social Enterprise. This episode is another inspiring story of someone identifying a need and doing something about it. Today you’ll meet Garret Koehler of Assemble Sound. As you will learn, Garret observed that the local music artists of Detroit were not easily collaborating, and in many cases leaving town to find places to produce music elsewhere. He discovered quickly that there’s an enormous amount of talent in the Detroit market, and was able to come up with a concept to bring them all together. By the way, all of the music you hear on this podcast show, from the openers, all the transition sounds, and the songs we play at the end are all from Detroit artists, curated by Assemble Sound. One more thing that I think is just really sassy is that they bought this old abandoned church and renovated it into this amazing collaborative space. It dramatically adds to the flavor of Assemble Sound when you’re there. I went there for this interview. Before we move too far, let’s see what Jentzen has prepared for us, as a fun fuel for this episode. Jentzen: Did you know that Jacopo Peri was considered the first composer. Peri wrote the first ever opera song in the late 15th century called Daphne. Now Daphne was written for John Adams to sing, and John Adams was one of the leading figures in the contemporary opera world. Just to be clear, this is not the same John Adams who was the Second U.S. President. Now since no music had survived from ancient Greece, Peri had to take his best guess at how music should sound. Now this story spoke to me because I feel that Assemble Sound is playing a similar role in reviving Detroit music. Romy: Thanks, Jentzen. Interesting info for sure. I want to thank personally everyone who has been submitting guesses for the mystery sound, sending questions into the mailbag. You make the show more interesting. If you’d like to support us on Patreon, please go to our website and click the Patreon link. We have some great supplemental content there for you. Okay. Let’s meet our guest of the episode. Garret Koehler. Garret, will you tell us, at a real high level, first about Assemble Sound. Garret: Yeah, I can do that. First of all, I’m just super happy to be asked to do this, and to be part of this conversation that you guys are having on an ongoing basis. I know that the conversation is high level, and you’ve had some great people on. I think that I speak for the whole [inaudible 00:02:43] community when I say that we’re just humbled and excited that you even think that were interesting or worthy to be a part of this podcast. As far as what Assemble Sound is, it’s essentially an initiative in Detroit to more effectively connect musicians here to each other, both across genres and within genres, and then to take that more connected community, and the city of Detroit community musicians and connect it to the broader music loving world, is what we like to say. That includes listeners, who love music. It includes purchasers of music, whether they’re editors at film houses in L.A., who are trying to pick songs for a movie or a TV show, or producers at an ad agency in New York, who are trying to pick music for a commercial. Our goal is to connect really the community here and then connect that community to people outside of Detroit who love music. Romy: Cool. If you listen to the very beginning of this episode, the music as our opener on this podcast is here from Assemble Sound. How did you originally connect all this together, Garret? Yeah. This is a project that really found its genesis a little over a year ago. I’d been doing shows in the city, putting on shows as sort of a promoter, and I guess you’d say an organizer in the music space. We had done a pretty show with a couple of different bands. It was Passalacqua, it was Tunde Olaniran, Flint Eastwood, and a bunch of DJs around it. After the show, it was primarily Flint Eastwood that sat down with me, Flint Eastwood’s Jax Anderson and Seth Anderson and brother is a songwriter behind the group. We were talking about Detroit and the state of the music scene here, and there is, I think, an overwhelming feeling amongst the music community that this is a city that is sort of inexplicably rich in its music output. It’s almost like no one knows why Detroit has been able to put out such great music for so many years, not just within one genre, but across so many genres. This is really an amazing place to make music. It’s a really difficult place to find sustainability as a musician. The story over time has been the great musicians from the city, essentially after Motown left. Motown was the end of the ’50s and then by ’72 Motown moved out to L.A.
After Motown had left, some of the major labels had offices here but for the most part with the downsizing of the industry, which really climaxed in the early 2000s, you had all the majors shut down their offices in Detroit, and you really didn’t have an industry presence here. What you saw was … Since Motown left, most of the major artists who have been from Detroit have found success in other cities. It made sense, I think. Think about Jack White, and him really blowing up and defining garage rock in Detroit. But he set up his Third Man Records in Nashville. You think of Eminem, who still lives outside the city and built his whole career here. But Shady Records is based out of New York. I think it’s great for the city that both of those institutions exist and sort of represent Detroit in both national and New York. But I think it does speak to this pattern that we’ve seen in the city when it comes to musicians who really build their craft here but then have to leave to find really sustainability. Flint Eastwood, when I sat down with him at the table, the conversation really became, is there a way we can keep them from leaving, from going to L.A., from going to Nashville, from going to New York, and the short answer was, we’re not sure. But we thought the one thing that we know to be true about the scene that we think would be a starting point would be to address the fact that the music scene in Detroit, though being very rich, is very fragmented. You have a lot of artists across genres, doing really amazing things, musically, but they’re sort of working in isolation from one another. You have all of these different people excelling in their own genres, but they’re not working together, they’re not necessarily sharing knowledge, and the idea was could we create an environment that facilitated artist development simply by creating a space that convened musicians, that convene them to be creative, that convene them to learn together. We committed, I think, during that moment of let’s do this and decided to call it Assemble Sound at the time, I was doing shows behind the brand name Assemble. I decided let’s focus Assemble’s mission and make it all about music, let’s make it really targeted. What we did is we said we’re going to commit Assemble to that broad mission and then obviously the next question is, all right, we’ve got sort of vision at a really high level of what we want to do. But how do we do that? What do we actually do to connect Detroit musicians to each other? The idea was to build a music studio that facilitates collaborative songwriting between musicians across genres in the city, and have that space be small enough to be conducive to recording, but big enough to also double as a community space, a space where we could bring musicians in for album preview listening sessions where you all sit down and listen to sort of the rough mixes for a new album, and you can all give feedback on it. The idea was really a space that holds musicians out of their home studios, out of their practice spaces, not permanently. They’re still going to work in their home studios. You don’t need to go to a multimillion dollar studio anymore to make music. 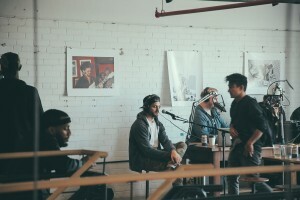 But a space that had a community that incentivizes people to get out of their home studios and then sent them back into the studios a little bit more informed and more connected. I think that we’re still waiting to see what the impact of a more connected music community in the city could mean. But I think the underlying potential of creating a big music community across a genre that sort of works in concert with one another is huge because the music industry has been one of the most complicated industries in the world for so long. But actually, it might be the most simple industry when you just reduce it to its most simple form, which is people making music and building an audience and that they’re trying to do it sustainably. They’re usually trying to figure out a way to monetize their relationship with their audience. If music and the industry are just about creating and building an audience, the question is how do you build an audience. Most of the time you build an audience by finding outlets for your work. In the digital age, outlets for your work can just mean other musicians who are tweeting about your work, or sharing your work on any sort of social media outlet or taking your work and remixing it and posting it on a digital distribution channel like SoundCloud. It’s like you start to leverage each other’s audiences to build each other’s audiences up. Historically, it’s been a much more top to bottom process of just hopefully getting signed to a label who has access to these major distribution channels like radio, who can push out your music to the masses, but music reaches the masses in a very different way. It’s a much more egalitarian way, democratic way. I think that we can sort of leverage the democratization of both the creation and the consumption of music to sort of create whole new models for developing artists’ talent. There is both a social mission to what Assemble Sound does in terms of connecting musicians; that’s first and foremost what we’re focused on. But I think there’s also a real economic effect that is always guiding the way that we’re thinking about it. Sometimes I call working class musicians, WCM, how do we create more working class musicians in the city of Detroit. That’s the other thing that we’re focused on. We don’t run the studio like a typical recording studio, as a business. We try to create opportunities for artists in the city by connecting them with licensing opportunities, or essentially placing music in either TV shows or film or commercial advertising. But again we have a catalog of music that instead of just being like any music from around the country we’ll put in this catalog and shop it around to producers; we’re very very focused on building a catalog that ranges from techno to punk, but shares a geography right. It’s all sort of southeast Michigan artists because the idea then is that when you approach the ad agency you can say when you spend money with us on music, you’re directly impacting the creative community that you build your business in. When you’re talking to an ad agency they’re thinking about, man how do I hire a Michigan grad to come to Detroit instead of going to Chicago. Well, part of that sell is Detroit’s got an amazing arts scene. If you’re an ad agency, I think you actually have a responsibility both to yourself and to your community to invest in the creative community that you exist in. I’m not asking you to do it altruistically. I’m saying one, the music is as good as any music you’re going to get from anywhere else, and two by putting an extra $3000 into an artist’s pocket because you use their song in a 15-second Instagram spot. What you’ve done is given them the money they need to bolster their live show, which is the show that your employee is going to go see on the weekend. The whole Assemble is very much about building that community, but I think that we’re also conscious of the fact that you need to inject that community with capital to make it sustainable. We oftentimes talk here about closing the gap between capital and creativity within the context of community. I think I gave you a very long explanation, sorry, for the way the genesis of Assemble came in, but it was really about how do we create opportunities for local musicians in Detroit. The hypothesis was what we started with connecting each other. That’s really what we’re focused on is connecting musicians. Romy: What gave you the idea, specifically, to catalog all artists? Garret: The idea for the studio actually, Seth, one of the partners, his dream had been to build this studio that facilitate a collaborative songwriting because it was something he and Jax did a lot when they were down in L.A. They said, we go to four or five sessions a week, and we’d be sitting in with artists that we didn’t even know, and we’d be writing together. It was the sort of really an incredible environment where you just had to learn how to find similarities with people you can find similarities with, and it was really motivating. There was this collective sense of momentum. He just wanted to create that in Detroit where he saw the sort of fragmentation. The original idea was you think we could get foundation funding or make this a nonprofit studio. I just believe there’s still a lot of value in music. I know it intuitively, I think you and all your listeners know it intuitively right, that music it has value. The question is, does it still have monetary value, and it does. That was sort of the realization that I had as we started talking about this was there is still money in music, and we started doing our research, and it became really clear that a lot of the money when you’re not talking about touring, when you’re not talking about live shows, most of the money music is in sync licensing, which is placing music and all the channels that I mentioned earlier, TV, film, advertising. I actually think that opportunity is only going to grow as more and more content hits the Internet, as more and more content hits the Internet. You see channels like YouTube starting to clamp down on the illegal use of music, as more of these what were just social platforms now try to figure out how to monetize. All of the sudden they’re monetizing on music that if you haven’t got the rights to, you’re illegally making money off something. I think the opportunities are going to grow in licensing, and we looked at sort of the marketplace for licensing, and we said, there’s a lot of companies who do it really well. But no one’s trying to really target a geography with their licensing revenue. We just thought that it would be really interesting to catalog the music of our geography. I think Detroit might be unique in that sense. It’s why Detroit, from so many reasons, is the perfect place you’re going to find a whole rock scene here that will challenge anyone’s rock scene in terms of its quality. But then you’re going to go, and you’re going to find a whole techno scene that’s going to challenge any electronic production scene in the world. The diversity of music you find in the city really makes it conducive to cataloging. What’s cool about Detroit is all of that music is here, and it’s here in really great quality and massive quantity. It was pretty much the first thing we started doing. We got connected with Nicole Churchill, who is now a partner here. She’s brilliant when it comes to the whole licensing in music supervision world. We just started attacking. We met with musician after musician, and we said, your hard drive sitting in the closet that could be making you money. It’s not making you any money when it sits on a hard drive in your closet. If you don’t want to make money, cool, but if you’re interested in getting this in a catalog and having it pitched, that’s something we can do. We spent pretty much the last year building up that catalog. There’s a lot of overhead just in terms of time with us. Key wording all the music has to be key worded by genre, instrumentation, musical comparisons of bands they sound like. Essentially, anything you might search, if you needed music. You need to be able to type in a keyword, and then it’ll pull up a track in our catalog. There’s a lot of overhead. What we’re really interested in is creating a software platform that allows artists to keyword their own music in a way that’s appropriate for licensing and then feed that data into our backend catalog. They have access to all the associated front end analytics, so if we’ve got clients, who are searching music and playing stuff on our catalog, the artists who are keyboarding and providing all that music on the back end themselves, also have access to a dashboard that would show them which tracks clients are listening to the most, and it allows them to start to tailor some of their more commercial-oriented creative work towards like what clients actually are listening to. We really are trying to build out a more artist-centric framework for licensing that’s the goal. Romy: Let’s transition. We’re sitting in a really cool side room of a church that’s been renovated. Let’s touch on the place because you pick this out really thoughtfully around this convening notion, right. Will you give us a tour of that story? Garret: Yeah, for sure. I think the vision was to convene musicians. It was really to convene musicians around this shared belief in creative collaboration and economic cooperation. The idea that both of those things can be a foundation for success for musicians and for the local music scene that those musicians participate in. We thought where historically have people convened around shared beliefs, in churches right. The cool thing about Detroit is there’s a ton of churches, and there’s a ton of abandoned churches and underutilized churches. I think most of your listeners probably, at this point, are aware of the narrative of Detroit in decades and decades of economic decline, and what that did to the physical landscape of the city in one of the things that anyone who drives through the city realizes that there are churches everywhere. We realized that acoustically a church would be sort of the perfect space for what we wanted to do like, I said earlier, acoustically recording and be the most interesting space to record in, but it would also be big enough to house people, and to house a bunch of people, small enough to record, big enough to house people that were sort of the dream. Romy: What the church also provides is a rectory. 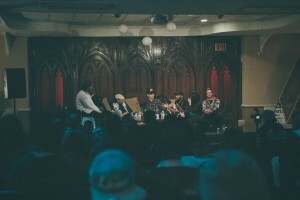 The idea was to have a rectory with a bed and breakfast for touring musicians so that touring musicians can come through, get studio time when they’re on the road, stay and get directly connected to the local music scene. From the get-go, literally that first coffee we had we knew we’re going to do this, and we’re going to do this in a church. The church loves the studio and the sanctuary, and then convene people in the sanctuary, and then we can build out this bed and breakfast component in the rectory. We just drove around Detroit and made a list of all the churches that looked conducive to what we wanted to do and wrote handwritten letters to all the owners, and said, hey this is what we’re trying to do. We were really straightforward about it. We didn’t try to tell anyone we were starting a church, or tell them we’re starting a different type of church. We ended up getting contacted by the owner of the dream church on our list is this historic St. Paul’s, built in 1870, one right in front of Michigan Central Station, which is the iconic abandoned train station in Detroit right in Roosevelt Park. Pastor Freeman, who’s the guy in the church before us. He had a vision for what he’s doing right now in Florida. Because he moved down to Florida about five years ago and they locked up the church. He got our vision, and we got sort of what he’s trying to do down there, and he just said let’s make this work. I know you guys don’t have a ton of money, and I need some money to get what I’m trying to do, and you guys need this building, so let’s find a middle ground. He flew up to Detroit to sell us the church and then one thing that he said, when we closed on when we signed the paperwork was, I was thinking about it and sort of deciding whether or not to sell the building in. He is probably going to sell it for a lot more money, but he said the moment you choose money over people is the moment that God forsakes your vision. I’m not even a religious person, and I was like, I think that we can all learn from that. Right. At the moment we choose money over people is the moment that we probably lose a lot of credibility in what we’re doing. We probably undermine our own efforts when we do that. We ended up getting this church last March, and had to repipe it, and heating issues, and that’s been a pretty DIY effort. But we’re in here and we’re operating, and we’re working on raising money for the full renovation to restore it to the grandeur that it definitely had in 1871. It’s got a 360-balcony in here that they built across in the 1980s. They built a whole second floor across it. We’re going to open it back up. When we open it back up, when you walk in that front door you’ll see a 55-foot vaulted ceiling. You’ll see a pipe organ that goes from the balcony up to the ceiling in the back of the pulpit. All that stuff is sort of buried right now in dry wall or upstairs. Romy: But we know the organ works. Garret: But the organ works. Yeah, 1909 Este Organ one of two that they installed in Michigan. As far as we know, it hadn’t been turned on about 45 years, but we got it fired up. It needs a massive cleaning, but it’s going to play. Romy: This place is just outstanding. I know it’s only the beginning of what’s going to be here. There’s what three studios in here now. Romy: There’s a recording going on right now in the background. I can hear percussionists on the air. Garret: Yes. We’ve got a studio A, which is built sort of under the control room. It’s actually in old pastor’s office upstairs, and then we opened up the classrooms and exposed the vaulted ceiling to the live room under the vaulted ceiling. Then we’ve got two other writing rooms, built out right now that are sort of basic studios. Then the plan hopefully this winter is to waterproof the steeple and then build what we’re calling the bird house studio. It should be sort of underneath the bell tower. We’d have three writing rooms and then the main studio A. Like I said our model isn’t let’s rent out, let’s build four studio rooms because we need to rent it out and maximize the value of that space. We need four studio rooms because we’ve got a residency that is comprised of, at this point I think it’s eight, but it will get up to about 15 artists, and it’s a mixture of bands, producers and songwriters who get 24/7 access to the space. They use it for free. They can bring whoever they want to work for free with the stipulation that every session that’s booked in this church in any studio has two seats open for collaborators, and those seats are to be filled by other residents. So our expectation is if you’re a resident, once, I think it is every two weeks, you’re expected to sit in on someone else’s session, a session aside of your own and write with them. If you try to book a session here, and you say I want to do it privately, I just want to work with me and my producer, whatever, we’ll say it’s cool, but there’s a fee for that. We actually built less studio model that incentivizes collaboration, and that applies to outside nonresident artists book the studio, it’s a pay what you can afford model. We’ve got normal studio rates, but it costs more to close down your session so that the church residents can sit in on it. One of the hardest things is after we got in the space and built out the studios, it was like, man we had this idea of a collaborative studio, but what does that actually look like. Now that we have the space, how do you take what is a very personal process and practice, right, songwriting, creation of music tends to be one of the most intimate processes, and how do you make it conducive to collaboration? How do you bring in a bunch of different artists from different backgrounds, making different types of music and have them do it together? At the time, it felt like time wasted because it was just sitting in front of a white board. It’s funny how you end up diagramming things that probably don’t need to be diagrammed on a whiteboard, but that was sort of an aha moment when we came up with this idea of doing this collaborative residency model. We’re excited to roll that out. We’ve been playing with the mechanics of it all, and we’re going to roll it out formally at the end of the winter. Romy: Are you noticing, when you first start to talk about that even with artists who’ve been so used to doing it alone, anyone yet starting to say, gosh, kind of sound hopeful instead of scared? Garret: Totally. I was just talking with Nigel upstairs, who’s a producer from the group Nigel & The Dropout, and he said I’ve never collaborated with anyone before I got in this space. I think that we were kind of pulling him in. We were like, yo, we really want you in here. We really want you in. He finally came in and just set up, and he forced himself through some really uncomfortable moments, and now he writes with anyone every day. I think the quality of everyone’s work has gone way up because all of a sudden it’s like you’re accountable to other musicians whose opinions you respect. They’ve earned your respect because they’ve got in the studio with you. There is a cool level of respect in here. When you create that environment, that’s really respectful. All the sudden people are willing to become a little bit more vulnerable in front of each other. I think the quality of music that’s come out of this space so far has been exponentially better than what it would have better if we didn’t have this collaborative foundation for what we’re doing. I would say every artist who’s come in here has initially been uncomfortable, every artist. A lot of artists, I think, have been intimidated by it. Usually, the things that make you better or more successful are the things that at first make you terrified. Romy: If you could dream big, resources weren’t an issue, what could this look like if you just let yourself dream? Garret: This is the easiest one to answer because it’s sort of what we do every day. There’s three buildings on this historic campus. It is the sanctuary, the rectory, and far residence. The residence is boarded up. The goal is to turn that far residence into this boutique bed and breakfast where touring musicians that are coming through town, and they might be playing a show at the film or at the shelter, or at Populuxe, and these are all Detroit venues. The dream would be that they’re staying at this. There’s artist-centric hospitality in this residence, two doors down, and maybe in the afternoon, before their show that night, they’re walking, literally, two doors down and popping in for their two-hour studio session. And while they’re in town, they’ve already hit us up because they looked on our blog or had been through before and they know that Flint Eastwood is a resident, and they’re like, hey, while we are in town, we really want to get a two-hour writing session with Flint Eastwood. They do that. They come down, and they write with Flint Eastwood. That connects Flint Eastwood to their audience, which is maybe based in L.A., which is great for Flint Eastwood. It allows them to write while they’re on the road and have a just really good experience in Detroit. I think that the bed and breakfast up and running, until it used in that way, and then the building next door right now, it would be amazing to have offices. So we’re crammed in a back closet right now in the church because we’re trying to use as much of the space as possible for music. But if we moved our offices into the rectory, we’d probably put two suites upstairs for more artists to stay, and then do some sort of public space whether it’s a bar that open to the public once a week, so they could come in and connect to this whole creative ecosystem. But otherwise, it was sort of just more of a community space, like the music campus. Then the goal with the sanctuary is like I said open it up, and I think the dream would be it’s all 100% occupancy. There’s always music being made in here. There’s always a rotating cast of characters that looks like people you never assume would write together, work together, but they do. Maybe once a quarter, we open the doors and do a recorded live performance where we invite the public into the space, and they can experience the power of the space. I think the room would hold like 300 people for that. Then maybe some container studios, dropped in those empty lots around us too. Yeah, I think that’s sort of like the long term vision. We imagine, hopefully, injecting, $10 million into the local music economy through licensing. I think in the next two, three years you’ll see national TV spots, you’ll see campaigns for movies; you’ll see TV shows on major networks have Detroit music in it. Romy: It’s the way it all starts, right, somebody takes the step. You say so many things on this show. This issue of sustainability, everyone talks to me all the time, social enterprise, sustainability, and I always say, the listeners have heard me say this so many times. The first rule of sustainability is to keep your doors open, like bring in enough revenue to stay open. That’s a hard enough feat in itself sometimes without getting too crazy, but you’re right. At the same time, money is not the all being. We don’t want to come to worship it, but it is a tool of the trade. It’s just one of the tools we need to keep the sustainability going. So it’s that simple. Since we don’t live in a trading culture, we actually use dollars. Garret: Yeah, got to make some dollars. Got to make some. Romy: And that’s why you do need a few of those floating around in everybody’s pocket. Romy: How do they reach you if they want to get on your Twitter or Facebook? Garret: Yeah. We’re relaunching the Web site right now. It’s Assemblesound.com. You can find us pretty much anywhere you look for us on Twitter, Instagram, Facebook. You can send us a letter. We love letters. 2300, 17th Street, Detroit Michigan 48216. You can also e-mail us, info@assemlesound.com. Romy: Well, thanks so much, Garret. Garret: Yeah. Thanks so much for having me and us on, and listeners of music. Romy: Well, we have to close out Assemble Sound with one of their great artists. This is GRiZ with It’s Over (but it’s just beginning).